Reprinted with permission (c) 2001, The Taunton Press, Inc.
"How would you like to design a 'bahn' for Charlie and Monika?" That question introduced our office to this project. 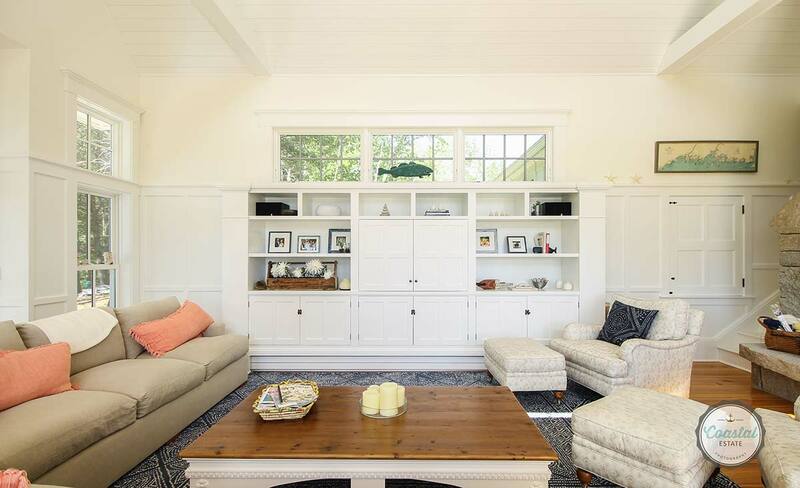 At the time, we were nearly done with a renovation of the couple's 80-year-old summer camp, which occupies a waterfront site on Mount Desert Island in midcoast Maine. When the project was started, we were asked to upgrade the facilities as much as possible without spoiling the camp's rustic nature. Preserving the camp as a camp, however, left some items from Charlie and Monikaâ€™s wish list unfulfilled. Nearing retirement, Charlie wanted a workshop to pursue boat-building. Their grown children, all musicians, wanted a space for recording and playing. 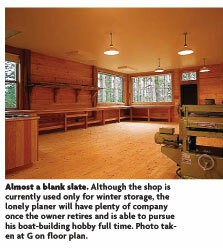 Everyone wanted a winterized space for year-round retreats. We were asked to design a large, flexible structure to satisfy these needs. 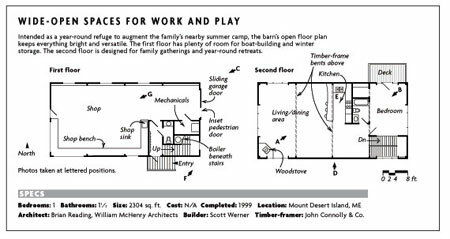 A two-story barn with first-floor shop and second-floor living area was the solution (floor plans, P. 110). 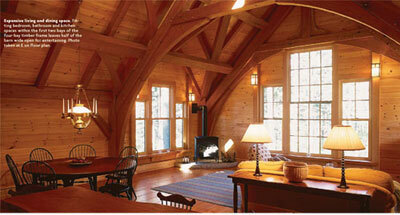 Our design was inspired by traditional barns from New England and Northern Europe. A native of Sweden, Monika provided us with images of traditional structures from her homeland while we made our own study of the numerous barns on the island. What impressed us most about the Northern European barns were the bold, rustic interiors of the exposed timber-frame structures. Charlie and Monika wanted the new structure to have the same sort of character, but they also wanted plenty of natural light. Our solution was to funnel natural light into the barn from as many directions as possible, starting from the top. 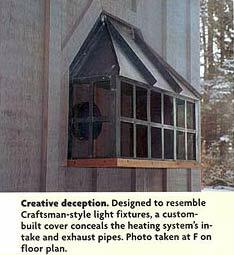 We designed an elongated cupola called a monitor for the roof (photo p. 109). As an old architecture professor used to say, the monitor will "bring it in high and let it down softly." 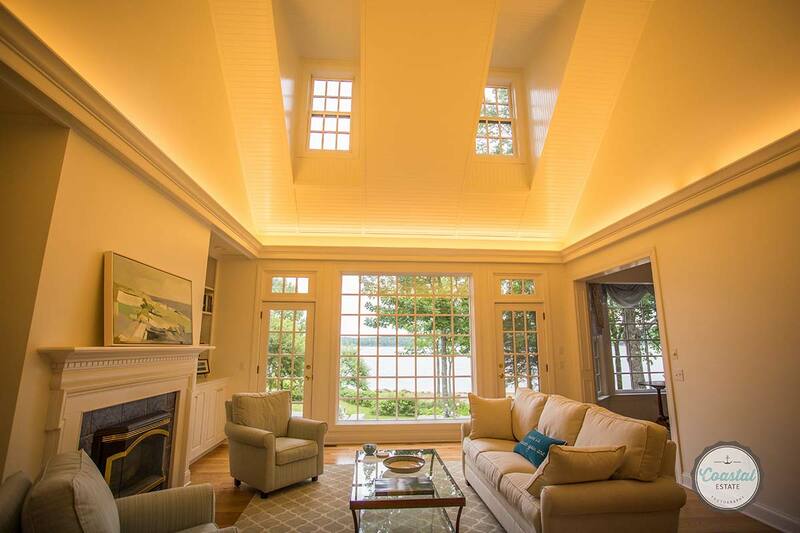 Similar to a clerestory, a monitor is a continuous raised section of roof with vertical windows; we used remotely controlled awning windows that promote natural cooling in summer. Located within the middle two bays of the four-bay timber-frame structure, the monitor bathes the interior of the living space with indirect sunlight (photo facing page). Natural lighting is enhanced by the opposing dormers and the large windows on the gable ends that brighten up the perimeters. 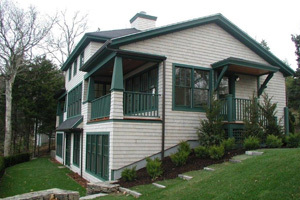 The timber frame is recycled Douglas fir that was salvaged from St. Lawrence Seaway "boom stock" (the booms used to corral pulpwood logs destined for Canadian paper mills). We found the supplier through an Internet search. The otherwise clear fir was flawed by numerous 1 Â½ -in. dia. Iron-stained bolt holes, but Charlie and Monika did not have a problem knowing their timbers had a past, especially because the stains were easily removed with oxalic acid. For architects whose houses are typically framed with stud walls and trusses, seeing the 12x12 posts and 8x8 primary rafters assembled for the first time was impressive indeed. We arrived for a site visit just after all five bents had been tilted into place and the crew had begun laying the deck for the second floor. When general contractor Scott Werner asked us what we though, we were speechless. The frame was beyond beautiful, and it seemed a shame to have to cover it up. 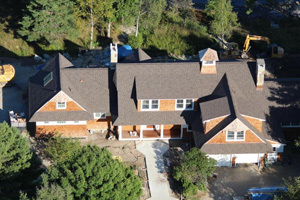 We covered the timber frame with a Galvalume (GSP of North America; 360-750-5791) standing-seam metal roof. We chose Galvalume for its durability and its fire-resistant qualities as well as its inherent barnlike appearance. 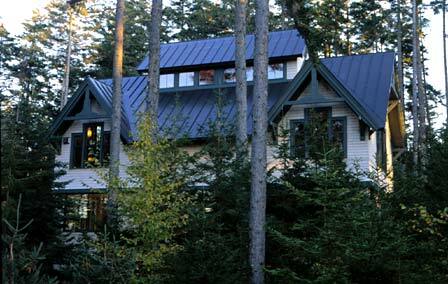 The roof is painted dark bronze to help the tall structure blend into the woods. The siding was designed to break up the vertical dominance of the structure. Board-and-batten western red cedar is installed beneath the overhanging belly bandâ”€an extension of the barn-door track coverâ”€with predipped eastern white-cedar shingles above (photo left). Another band was created directly below the windowsills by decreasing the course exposure of the shingles. The sliding garage door has a pedestrian door cut into it, but the formal entry is along the side of the barn. To enhance the lofty feeling of the exposed frame, we wanted the approach to the second floor to be somewhat constricted. You enter the first floor via a small mudroom with a relatively low (8 ft. 6 in.) ceiling. Straight ahead is the shop; a right turn leads up the stairs. The four-bay timber frame dictated the second-floor layout. The bedroom and stair occupy the first bay. The bedroom is separated from the stairwell by a partition wall with a large decorative window (photo p. 107). The window is just above eye level in the stairwell, which helps to maintain privacy yet allows sunlight from the dormer window to flood the bedroom. 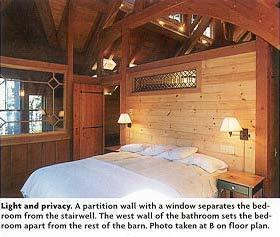 The bedroom walls were built high enough for visual privacy but low enough to leave the barn's timber-frame ceiling open from front to back. The bathroom shares the second bay with the kitchen. The galley-type kitchen leads into the living and dining "great room" space, which occupies the third and fourth bays (photo facing page). You like wood, don't you? 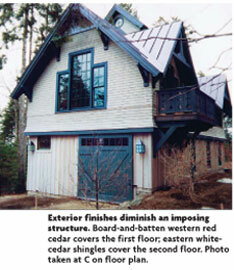 Not surprisingly, the exposed timber frame serves as the focal point for the interior finish strategies. The plank floors, the wainscoting in the stairwell and the interior slab doors were all milled from the same stock as the frame. The doors are hung with handcrafted strap hinges (photo p. 107). The cabinets were also custom-built using recycled fir. The contractor stockpiled vertical-grain lumber for the rails and stiles of the cabinets to ensure stability of the frames. Other woods were used to lend contrast. A 2-in. thick slab of Pennsylvania cherry serves as the countertop for the kitchen peninsula. 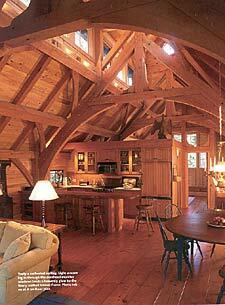 The knotty-pine walls and ceilings (along with the hackmatack knees) balance nicely with the honey-colored fir frame. Although it takes up nearly three-quarters of the first floor, the shop (photo right) was left empty for Charlie and Monika to fill as they approach their retirement. The only requirements they gave us for the shop were that it be well lighted, have 10-ft. ceilings and have room to store a car during the winter months. We satisfied the lighting criteria with a generous mix of windows and incandescent and fluorescent lighting. The oversize windows along the northeast corner are larger versions of the windows that are in Charlie and Monika's beloved waterside camp. The floors are 2x6 tongue-and-groove spruce, the walls are local rough-sawn pine, the ceiling is painted drywall, and the 20-in. planer is made by Powermatic. Licensed architect Brian Reading of Bangor, Maine, works for William McHenry Architects in Blue Hill, Maine. Photos by Tom O'Brien, except where noted. Originally, the formal entrance was on the other side of the barn. After the framing and mechanical work was done, however, Monika asked that we move the entrance. We were glad to accommodate her, but moving the entrance meant that the intake and exhaust pipes for the high-efficiency propane boiler would be the first items to greet visitors on their way into the barn. © 2019 Details Inc. All rights reserved.